This is a more serious post than usual. Sometimes it is helpful for me to write out my deep thoughts, especially if I am wrestling with something. A few months ago, a friend hurt me deeply at a time when I did not have the physically, emotionally and spiritually exhausted–right after JJ’s cancer treatment ended. The situation with my friend has caused me a lot of heartbreak because we were friends for a long time and I love(d) her very much. In the process of coming to terms with this, a lot of emotions have been resurfacing. I have been pondering the ways in which people are different, how we treat those who are different from us, and many other things. This will probably be a two-part post. I will start by discussing zoology. Zoologists group animals according to species, breeds, etc. There is a difference between the species of dogs and cats. They are different species and have different characteristics and behaviors. Cats, for example, aren’t much good at taking long walks on a leash. Neither are they suitable for guarding homes against thieves. However, cats don’t usually ask to go outside to pee at 1 a.m., they are great mousers, and, BEST OF ALL, they purr. My dog is totally oblivious to mice. I don’t even know if he knows what they are. Some people label themselves cat or dog people, according to which animals they prefer. I enjoy both because I value their differences. I don’t expect my cats to behave like a dog or my dog to act like a cat. Within each species are different breeds. 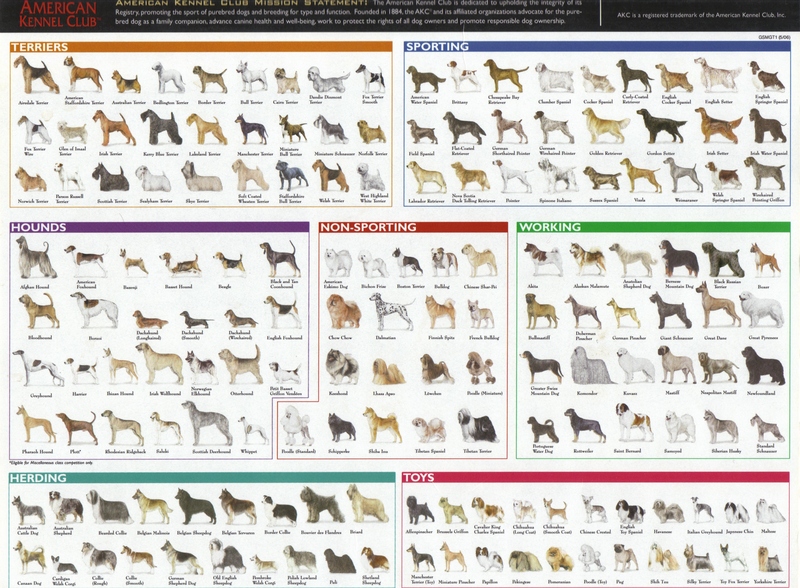 Our veterinarian has a poster of dog breeds in one of his exams rooms. We love looking at them every time we take a pet to the vet, reading aloud the characteristics of each breed. Some breeds are large, others are small. Some dogs are bred to be protective, others to herd animals, others to hunt, others to run, and others to cuddle on your lap. Some bark a lot; others (like Danny) hardly bark at all. Within each breed, there are differences in temperament. Some dogs are naturally more playful or friendly. Others, not so much. Temperament is also developed by how the dog was raised. For example, an abused dog will behaved differently–either more timid or more aggressive, depending on its personality–than one who grew up in a loving home. Knowing the species and breed and temperament of an animal helps us to understand its behavior and help a person choose the best type and breed of animal for themselves. I once had a co-worker who loved to run. She bought a whippet, a medium-sized dog who was born to run, so they could run together. It was a perfect match. The reason why I have just spent all this time discussing animal species, breeds, and temperaments is because in recent months EJ and I have been pondering and discussing personality types and I see similarities between zoological classifications and personality types. This is a topic that is very interesting to me. I think people can be divided into two “species”: Extrovert and Introvert. They are as different as….uhm….dogs and cats. They each have unique strengths and gifts…as well as weaknesses. Neither is inferior to the other. They are just different. I think it’s especially important for Extroverts to understand this because many tend to view Introverts as flawed and broken rather than uniquely different. Most Introverts could describe many occasions in which Extroverts told them they were too quiet, thought too much, needed to get out more, needed to learn how to have more fun, and so on. That’s like trying to drag a cat for a walk or expecting a cat to herd sheep or do tricks on command. That’s like expecting Danny to catch mice or purr. It’s not going to happen. Within the species of Extrovert and Introvert, there are different “breeds” or types. While every Extrovert has common traits and every Introvert has common traits, there are differences among types of Extroverts and among types of Introverts. 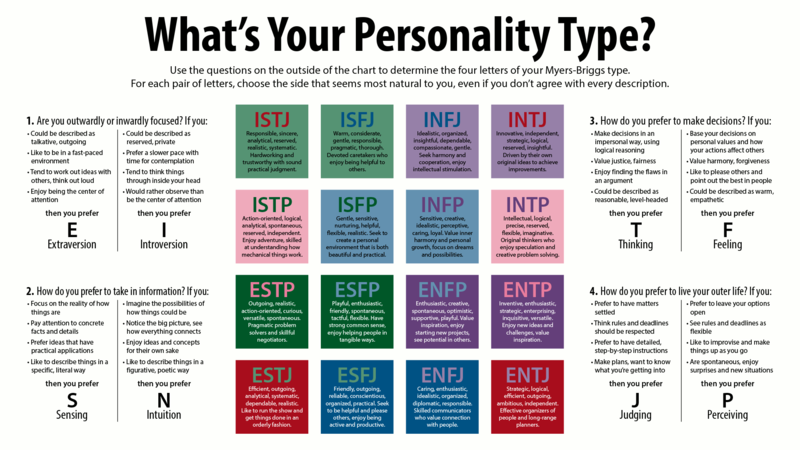 The Myers-Brigg Personality Test divides personalities into 16 different types. And, of course, individuals within each type–or “breed”–has different temperaments and have been shaped by different experiences. My species is “Introvert” and my breed is an INFJ. INFJs are extremely complex people who think very deeply. We observe everything, we process information differently than others, we make connections that others cannot see, and we can see from many different perspectives. Because of this, we have deep cunning insight into people and situations. We often understand people better than they understand themselves. We can’t always articulate all our deep, complex thoughts–we might have “insight” into people but not be able to explain why. We care very deeply about people and genuinely want to help them–we have no hidden agendas or thirst for power. We tend to be extremely gentle, compassionate, and empathetic to the point where we feel others’ suffering. We are excellent listeners and tend to be nonjudgmental. Because we are so empathetic, conflict and negativity takes a huge toll on us both emotionally and physically–so don’t expect us to be quick to engage in battle. However, that does not mean that we are spineless wimps. While we are very patient and understanding, we also are very protective of those we love, and we will fiercely defend our loved ones against those who threaten them. We are also very private people, very much the introvert, and very independent. We value integrity. Because we are so empathetic, we tend to attract emotional abusers who feed off our empathy and compassion. These are just a few of our traits. Understanding personality traits has helped me understand myself. (The desire to understand myself and others is an INFJ trait.) For one thing, it validates that I am not merely a broken extrovert who needs to speak more, think less, and be more social. I am ME and ME is a good thing to be. 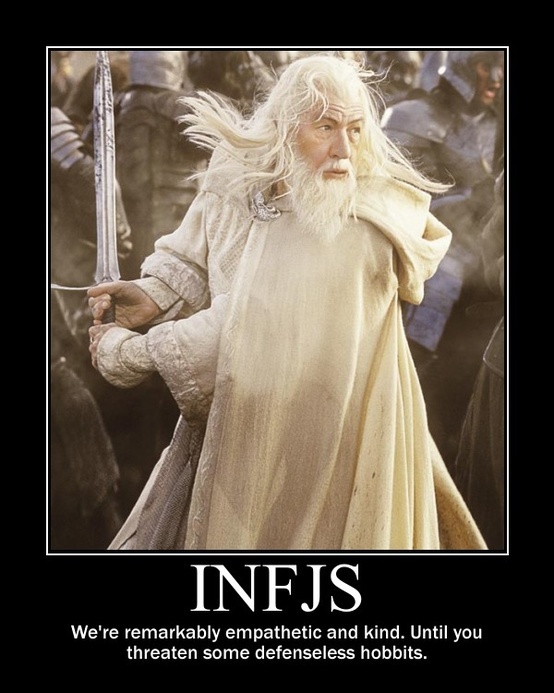 The fact that I love books, study, gardening, animals, walking, and even writing and that I am deep thinking, empathetic, understanding, and protective are all part of my INFJ personality. After learning of our types, EJ and I have discussed how often my insights about people are absolutely correct–to the point where I can often predict what a person will say or do under certain conditions with great accuracy, even though I cannot explain how I know. We pondered the times when we ignored my “gut feeling” and how often that led us into being hurt by unscrupulous people. We also have discussed how we can recognize the emotional abusers and prevent them from damaging us. This is vital. I will stop here. I will write more later.